Braden Rayburn takes his responsibilities seriously. So how's he supposed to run his newly inherited ranch while being an interim father to his orphaned half siblings, who don't speak a word of English? Especially since the onetime pro rodeo rider knows absolutely nada about raising a family. Lucky for him, he just met the beautiful answer to his prayers. The high–energy boy and girl twins had Elena Ramirez at "hola." 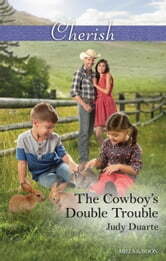 But being a nanny–even a temporary one–at Braden's Texas ranch wasn't on the bilingual Brighton Valley native's career path, even if her attraction to the kids' gorgeous guardian is mutual. Elena's big–city dreams don't include falling for a footloose cowboy. Or is the Rayburn rancher already the perfect family man?